KUALA LUMPUR: Naza TTDI Sdn Bhd, the property development arm of the Naza Group, plans to launch 18 new developments including new phases worth over RM1 billion by end of the year. Group managing director SM Faliq SM Nasimuddin said new property launches will include three high-end residential projects. "We are looking to launch 18 new projects this year, which include our three trophy high-rise luxury residential towers in Kuala Lumpur," he said at the signing of a service agreement with Telekom Malaysia Bhd (TM) here yesterday. Naza TTDI will launch one block with more than 50 floors at the company's RM4 billion Platinum Park development in Kuala Lumpur by third quarter. The second residential project is on a 0.8ha site located near the embassies, such as Singapore High Commission, on Jalan Tun Razak. The third residential project comprising 30 floors will be developed on a 0.4ha site in Taman Tun Dr Ismail. Among the new phases to be launched is TTDI Alam Impian in Shah Alam. Faliq said the company has 323ha of undeveloped landbank for its future developments - about 202ha are in the northern region and 121ha in the Klang Valley. It was reported earlier that Naza TTDI wanted to achieve a turnover of RM1 billion this year, from RM635 million in 2010. Meanwhile, TM vice-president of Selangor Datuk Zaini Maatan said UniFi's subscriber base stands at about 110,000 and the service is available in 68 exchange areas. The agreement will see TM providing its high-speed broadband services to TTDI Alam Impian by 2016, dubbed the first UniFi township project in the central region. Kuala Lumpur: Danajamin Nasional Bhd expects to guarantee another RM1.6 billion worth of facilities this year after backing some RM1.4 billion in the first half of the year. "We'll be seeing a more diverse set of industries being guaranteed from now on as well as more complex deals being approved," Danajamin chief executive officer Ahmad Zulqarnain Onn told reporters from the New Straits Times Press (NSTP) group yesterday. Danajamin guarantees enhance the credit ratings of non-"AAA" rated issuers, enabling them to access longer term capital via the bond market at more attractive rates. Ahmad Zulqarnain led an eight-member delegation of Danajamin top management on an official visit to Balai Berita, NSTP's headquarters, in Bangsar, Kuala Lumpur, yesterday. He explained that last year saw guarantees approved for mostly property companies because those deals were easier to process compared to, for example, independent power producers, which are more complex. Danajamin aims to guarantee some RM3 billion worth of facilities in a year. The institution has a underwriting capacity of up to RM15 billion across all sectors. To date, it has guaranteed facilities worth RM2.305 billion. Ahmad Zulqarnain said while the institution is focused on its mandate to help more corporations raise funds from the bond market, it is also exploring the possibility of securitising loans from small and medium enterprises. "We started looking at it after receiving enquiries from some banks, but it is still at the exploratory stage. It's more of a long term plan," he said. Ahmad Zulqarnain added that securitisation should be on an existing portfolio with a track record. This way, the exercise would add to lending capacity. "We need to understand the issues before we can proceed," he said. Securitisation of loans has been a controversial issue following the subprime crisis which crippled the US economy in 2007. KUALA LUMPUR: Property group AM-EL Group has launched a boutique luxury condominium located along Persiaran Raja Chulan, with a gross development value (GDV) of RM180 million. The St John Woods Residence condominium features 48 luxury homes housed in 33-storey towers that offers one unit per floor. Each unit will have three parking bays. The company is banking on its large unit design to attract buyers since surrounding condominiums that are available and undergoing construction offer smaller unit apartment or mix development projects. "Our strategy is to provide large luxury units that offer exclusivity and privacy. The lower density and limited number of units give the development its unique competitive edge," said project director Simon Low at the launch yesterday. "Not many developers are going into this market," he added. He projected about 70 per cent buyers will be coming from local customers. The homes range from 3,660 sq ft to 8,848 sq ft and are priced at about RM900 per sq ft or between RM3.3 million and RM4.4 million per unit. St John Woods Residence which sits on a 0.6 acre leasehold land is expected to be completed by June 2014. The group is confident of selling all its units when it holds a preview for the development this weekend. The total GDV for AM-EL Group's current projects is about RM400 million. It has two other ongoing residential projects in Penang and Taiping, Perak. 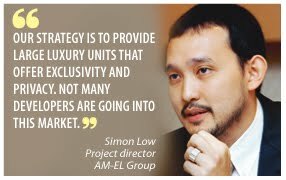 Asked if the group would consider mergers and acquisitions or to float its shares in the local bourse to further expand, Simon said AM-EL Group would like remain a boutique developer. "We would like to keep the company niche and family based," he added. His sister Catherine Low is the property sales and marketing director. Established in 1982, the company was founded by their father, Michael K.C. Low. To date, AM-EL Group has developed and sold 10 residential and three commercial projects like the Dataran Merdeka, Dataran Pahlawan, Crystal Prestige and Merc Residence. Kuala Lumpur: The Employees Provident Fund (EPF) may be the new owners of Quill 7 located in KL Sentral, sources say. Quill 7 is a 29-storey office building with a six-storey podium. The building has a total net lettable area of 356,759 sq ft.
Industry estimates for the building are in the tune of RM1,200 per sq ft or some RM428 million based on recent transaction value in the same area. The building, which is virtually full, with the exception of the penthouse, collects an average rental rate of RM7 per sq ft including service charge. Its tenants include Axiata and Nokia Siemens. It is understood that EPF had extended a loan to a special purpose vehicle to construct the building and under the terms, EPF has an option to buy it. Quill 7, previously called Tower D, is located on Lot J at KL Sentral, and developed by Quill Realty Sdn Bhd. It was reported during the topping-up ceremony that Quill Realty is 60 per cent owned by Quill Group and 40 per cent by Malaysia Commercial Development Fund (MCDF), which is a closed-end private fund sponsored by CapitaLand Group. A source told Business Times that tenants at the building had already signed a novated tenancy agreement which revealed the name of a new company understood to be linked to the EPF. Messages left at Quill group of companies to confirm this were not returned. Zerin Properties Group chief executive officer Previndran Singhe, when contacted to comment on the building, said: "KL Sentral offices have proven due to connectivity and with its MSC status, its ability to attract tenants worldwide. "This, plus limited initial supply, has pushed rental and capital values upwards. Moving forward, with the impending new supply coming into KL Sentral, we will see slightly lower occupancy rates with rentals remaining at present levels."